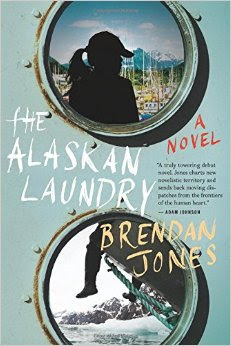 My review of Brendan Jones' The Alaskan Laundry appeared in today's Philadelphia Inquirer. So what's a nice, South Philly Italian girl doing in Alaska? Tara Marconi leaves her boyfriend, family, and job in the family bakery to venture to Alaska. She is 18, independent, angry, and tough, a Golden Gloves boxer. She decides to go to Alaska after her strict Sicilian American father kicks her out of the house. Father and daughter have issues relating to her mother's recent death. And she is wrestling with memories of a trauma she has kept secret from her family. "She wanted to disappear, like the dot when she turned off the TV, reduced to a point," Jones writes, "to reanimate on some different planet, find some new sun to orbit." Her cousin worked in Alaska on a fishing boat during a couple of summers, and his stories of Alaska, which he calls "the last frontier," inspire her to travel there. "Place is huge," he tells her. In this coming-of-age story, Marconi travels to "the Rock," a remote island governed by the seasons and the arduous, foul, often dangerous work of commercial fishing. She works first at a hatchery, then a fish processor, and then signs on as a deckhand on fishing boats. ... With ponytail threaded through the back of her Eagles ball cap, she perseveres, thanks to strength of will, the discipline and ability gained from boxing, the companionship of an adopted dog, the help of a few Alaskan friends, and the ever-present dream of owning and repairing that old tugboat. Note: I’ve never been to Alaska or worked in the fishing industry, but like Tara Marconi, I’m from South Philly. Like Tara and the author, I went to sea in my late teens (in my case, on an aircraft carrier). Like Tara and the author, I boxed a bit in my youth. And like Tara and the author, I lived on a tugboat (in my case, a Navy tugboat at the old submarine base in Scotland). I found Jones’ descriptions of things I know - South Philly, the sea, boats and boxing - to be accurate and vivid.